Redesign. One word that is feared by many businesses because of the process that it can become and the money that it mistakenly can take. Have you ever considered that it might be a very simple process? Or that it’s a way to invest in your business to help generate more revenue? How can you tell when it’s time to redesign your website? Here’s 10 reasons to redesign your website. 1. Was your site built more than three years ago? Yes? Then it’s time to redesign. Website development and code standards are constantly changing and being updated. Standard practices from a few years ago are huge no-nos today. Not only will redesigning (and re-programming) make your site look better, it can also help you with your search engine rankings. 2. Does your site look good on all devices? No? Then it’s time to redesign.With the increased use of mobile and tablet devices to access content online, your site needs to be accessible on all devices, not just computers. Don’t lose the opportunity to keep your customers or gain new ones. Your website shouldn’t just work on these devices, it should be easy for these users to access the content you are providing them. 3. Can you manage your own website content? No? Then it’s time to redesign.There is absolutely no reason not to be able to manage the content on your website. It doesn’t add much cost to the project to add a CMS (Content Management System) to your redesign project if you are working with a company that deals with them on a regular basis. We use WordPress and a completely custom CMS so we have options available for our clients. 4. Are your SEO efforts not making any difference? Yes? Then it’s time to redesign.It’s possible that the way your site was built is causing the hindrance in SEO efforts. If your site is built in tables (old development style), search engines can’t read the content the same way as a site built in divs (the newest way of developing sites). 5. Does it look dated? Fixed width content – does the site utilize the entire screen or just a portion of it? Animated anything! Animated GIFs are a thing of the past and an easy way to date your site. 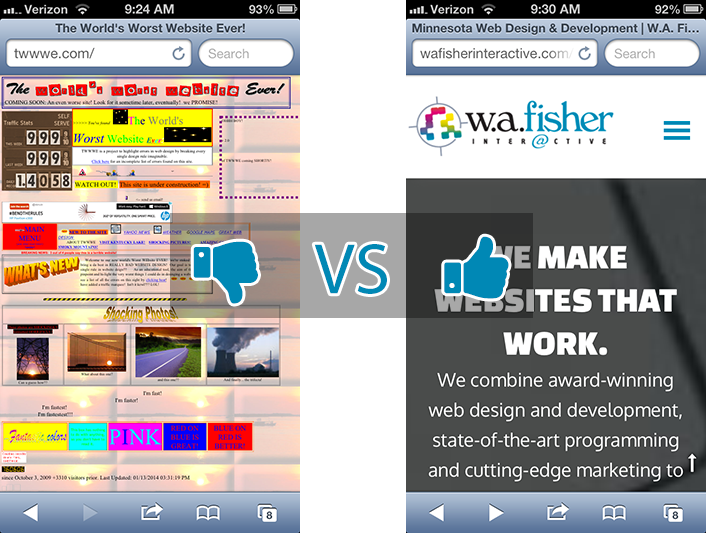 This is exactly what your website shouldn’t look like – The World’s Worst Website Ever. 6. Has your business model changed? Yes? Then it’s time to redesign.If your site was originally set up to promote a certain service or product and you now promote a different product/service, your website should reflect that. Not redesigning (or re-aligning) your website to fit your new business model can actually drive users away if they can’t find what they’re looking for.. which leads to the next question. 7. Can users find what they’re looking for on your website? No? Then it’s time to redesign.If your navigation is not intuitive or hard to find or use (small links on a touchscreen can be hard to click on) or if your users just can’t find what they’re looking for, they’re going to leave your site and go to a competitor’s site that they can find what they want. 8. Are your website analytics showing a decrease in visits, an increase in bounce rate or a decrease in visit length? Yes? Then it’s time to redesign.If people aren’t engaging with your website any more, there could be multiple reasons why they are going elsewhere for the information. It could be the design, it could be the lack of relevant content, or it could be because the site is difficult to use. A redesign can help to fix all of these things. 9. Does your website use Flash or gifs? Yes? Then it’s time to redesign.Not only do these technologies date your website (see Question #5), they also aren’t accessible on all platforms: for instance, iOs devices (iPhone, iPad, iPod) can’t display Flash objects. If your website is built in Flash, you’re automatically cutting out a huge portion of the population viewing the site on these devices. 10. Have you been thinking it might be time to redesign? Yes? Then it’s definitely time to redesign.